You love your dog, and you want to enjoy more fun and freedom together -- using love and respect instead of old-school methods that rely on force, make you feel guilty, and are as unnecessary as they are obsolete. But sometimes, when you're in the middle of it, you wonder if that's really possible or it's just a pipe dream. That's why I do what I do. Read on to learn my story. When you're done, you can also meet my dogs, or skip to the bottom to see my credentials. Me, my dad, and my little brother with baby bunnies. I was born into a life with dogs. I grew up on a farm so working with animals was a part of my daily routine. To my family, dogs were just another farm animal. But I always wanted more than that; I wanted my dogs to share every part of my life. I wanted communication and intimacy. In my childhood fantasies, I always had the ability to talk to the animals around me, especially the dogs. They say it takes 10,000 hours to achieve expertise at anything. Well, I've certainly spent 10,000 hours roaming the fields and woods with my dogs -- observing them, being with them, learning from them. I read everything about dogs I could get my hands on. When I was seven, it was stories about dog-human relationships, like Balto and Lassie and Where the Red Fern Grows. By the time I turned eleven or twelve, I had discovered dog psychology and animal behavior, and started devouring every book on the topic I could find. I was a nerdy kid growing up in a very small, rural town. I didn’t fit in and I didn’t have a lot of friends. But I was not alone: as always, my dogs were there. I turned to them when my heart was broken and I whispered my secrets into their listening ears. My obsession with learning to understand and communicate with them on a deeper level grew. Lucky for me, college provided an escape. Animal behavior wasn’t offered at my university, so I studied English, history, psychology, and communications, all the way through my master's degree. After graduating, I taught in a private school that focused on cutting-edge learning theory, then moved on to an alternative high school for troubled teens. After that, I coached global communications skills at corporations and universities. I've lived and worked abroad in Germany and Brazil, and I speak several languages. I'm a certified yoga teacher, too. Me in second grade, so engrossed in a dog book that I'm falling out of my chair. While I loved everything I was doing during that time, there was just something missing -- something four-legged and furry with a tendency to give sloppy kisses. So I began to put my passions in life together: building powerful relationships, learning everything possible about dogs, and understanding psychology and communications. Horizon Dog Training was born. I was learning a lot, and growing a lot. But as I learned, I stopped listening to my heart and my intuition, and started playing a role with my dogs. I was doing what more well-known or more experienced trainers told me I "should" do. I learned to use techniques that were not kind, and that I knew in my heart were not right. I'd lost that connection I had as a kid growing up, and I didn't know how to get it back. Thankfully, my dogs have always been my best teachers. They've been patient with me, and we've had so many adventures together. Through each one, my perspective has shifted. I've worked as K9 Handler for Wilderness Search and Rescue. When other people's lives depend on your ability to understand and communicate with your dog, a truly different type of bond develops. I've also worked in animal assisted therapy and seen how my dogs' wisdom and intuition had the power to transform others' lives. My respect for these amazing creatures continued to grow. I've rehabilitated dogs with severe aggression and fear issues and worked as a chairwoman in a dog rescue organization. With my own dogs, I've also competed and titled in a wide variety of performance dog sports. And, my dogs and I have enjoyed plenty of simpler, more relaxed adventures together. We love to hike, travel, and explore new places. I enjoy working outside at sidewalk cafes, and my pups like to hang out with me on the street and watch the people go by. It's all part of building a life together, and of coming to understand our canine companions in a deeper, more soulful way. My first K9, Spirit, and me, exhausted after a successful Search and Rescue mission. 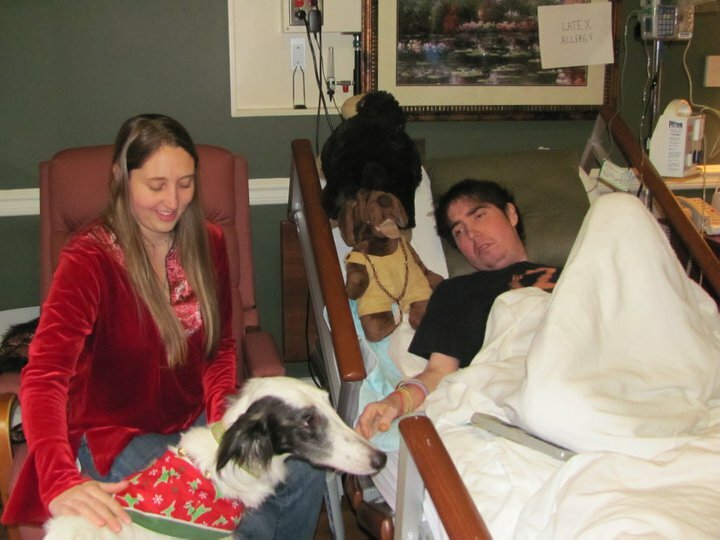 Therapy Dog Savvy and I, working together to fulfill a Last Wish. As we've journeyed, explored, and lived together, I've learned more and more. I finally reconnected my knowledge and my heart, and learned to truly transform my relationships with my dogs into something powerful and amazing. Each dog I've been privileged to share my journey with has taught me so many incredible lessons. I'm learning more from them every day. It's because I want to share the wonder I find in these relationships that I do what I do. I've seen all sides of it now, and I know that true connection is possible. My life with dogs has not been perfect, but it's been beautiful. I wish the same to you and yours. Throughout my life lived with dogs, I’ve been fortunate enough to enjoy the company of many unique and special souls. I’ve had the honor of sharing my life with rescued dogs, my K9s, show and performance dogs, and even a deaf and severely disabled Jack Russell puppy I found in the road. If you want to learn more about them -- my best teachers -- you can read more here. Or continue to the bottom to see my list of professional certifications.